I'm still working on my scrappy layouts and trying to finish the album. In between that, I take breaks and stamp cards. I pulled another $1 stamp out and worked on this Halloween card. 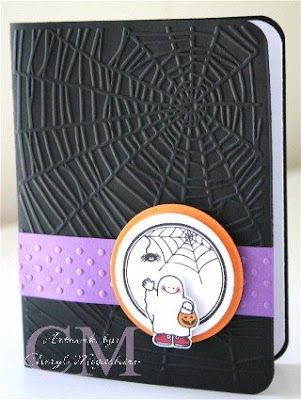 When I first saw that spider web embossing folder, I almost didn't get it because I didn't know what to use it for. Now I'm using it on all the Halloween cards. LOL! 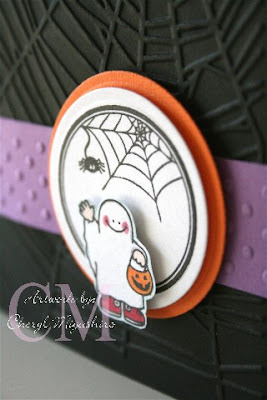 That cute little ghost stamp is a Dandelion Designs stamp. Here's a close up of the stamps and the layering. Inside of the card is stamped with "Happy Halloween". And while I was at it, I also made a Thanksgiving card. The turkey looked so lonely and untouched in my bin. I glittered his feathers and beak. And I used my Martha punch again. It just adds a little touch to the card. Added some Hero Arts bling to the punched out design. 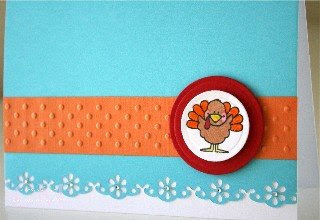 Inside of the card is stamped with "Happy Thanksgiving", another Dandelion Designs stamp. Thanks for stopping by and if you have any questions, just email me. Guess what I gotta get that MS border punch now, so nice. Are you SALES repping for MS, too. And gotta get some halloween from Dandelions, too. Yes, Cheryl the enabler ... you're going to get all of us running to the stores to buy more stuff ... but love the MS punch - it embosses too? Oh, so CUTE!!! Why am I suddenly wanting to buy that spider web embossing folder now too?!! !